Left Fork has published several books since opening shop in Fall 2014, with more forthcoming. Scroll down for more info on what’s out in the world already, or click here to see what is available from our new imprint Flowstone. A compelling collection about living in Del Norte County, California, direct from 41 people who live there. In their own words, a diverse array of 41 people who call the county home share their lives and illustrate both the beauty and challenge of such a unique area. Readers will appreciate the frankness of contributors. In an area with some of the lowest health and educational outcomes in the state, contributors didn’t shy away from sharing their very real experiences of daily life. Learn more about the book here. Here you’ll find tales of fantasy and adventure. You’ll find 3 pigs, 4 kittens, 6 siblings, and, well, more kittens. Mix in assorted musings on time and blueberries. But be careful here, lest you get trapped in a “Never-Ending” Adventure Story. Yes, it’s stories as only can be dreamed up by the mind of the one and only Kailen. Come along and learn… the Magician’s Secrets. 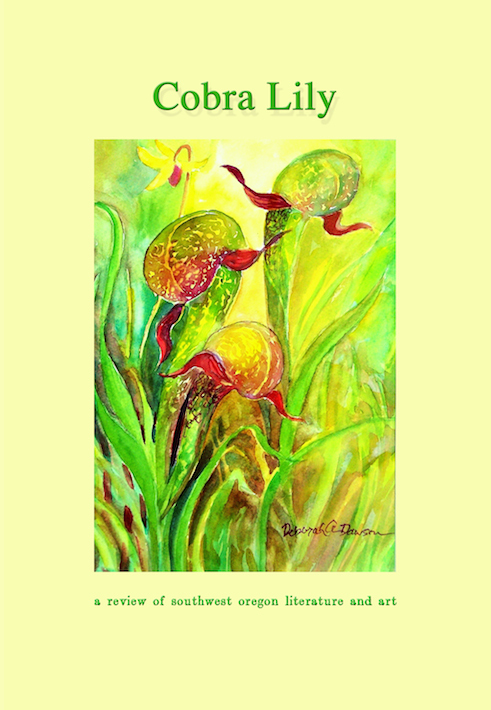 Cobra Lily is a review of art and literature, focusing on the cultural and natural environs of Southwest Oregon. Issue Four features the work of the following artists (in order of appearance): Abbigayle Jolley, Susan Gustafson, Franklyn Tosh, Pamela Haunschild, Hannah Andrews, Miles West, Iris Chinook, Jeff Powell, Cord MacGuire, Michael Franklin, Jessica Cannon, Zvi Baranoff, Lindsey B. Jones, Kate Taormina, Michael Spring, Coreen Davis Hampson, Barbara Parchim, Josh Pool, Ryan Forsythe, and Rory Forsythe-Elder. Available now. Takilma Common Ground was created in 1994 to increase communication and stimulate discussion in the community of Takilma, in Southwest Oregon. Volume 3 of the anthology collects the third 25 issues. There is no finer chronicle of life in Takilma, past and present, than the Takilma Common Ground. Published by Takilma Common Ground with the support of Left Fork. The editors gratefully acknowledge the ongoing support of the Takilma community, all past and present volunteers and staff, and all writers, artists, and photographers who have contributed. Available now. Cobra Lily is a review of art and literature, focusing on the cultural and natural environs of Southwest Oregon. Issue Three features the work of the following artists (in order of appearance): Joyce Abrams, Gary Lark, Desmond Serratore, Gray Conway, Susan Gustafson, Isaac Baranoff, Hannah Andrews, Marlyce Andrews, Morgan Andrews, Deborah Ann Dawson, Hazel Danene Speer, Lily Mayo, Lucas Tillett, the Oregon Caves Rangers, Donna Parrish, and Zvi Baranoff. Available now from Amazon.com. Please note Issue Three is dedicated to the memory of David Newell. David was a wood carver and artist familiar to most throughout the Illinois Valley. He enjoyed playing banjo for his marionette gnomes and fairies, and also throwing spears with an atlatl (he also happened to have made the banjos, marionettes, and atlatls). His first full collection of poems, The Poem Said, was published by Left Fork in 2015. Each of the first two issues of Cobra Lily included several of his poems. Woodwoo can’t “sa-squash” a log into mush, not like a full-grown Yeti…not yet! But he wants you to know he is still big and strong compared to a bear or ape. After all, he stands almost eight squirrels tall and his feet are tougher than cedar bark boots. In this book Woodwoo shares his favorite foods, activities, and sounds. But what he thinks smells sweet might not smell sweet to you. Mostly, this little sasquatch wants to share what makes him woo. And what is Woo? Come along as Woodwoo welcomes you. Bring your imagination and stomp or shuffle into the little-known world of this little sasquatch. Takilma Common Ground was created in 1994 to increase communication and stimulate discussion in the community of Takilma, in Southwest Oregon. Volume 2 of the anthology collects the second 25 issues. These issues often feature responses to themes, in the form of articles, essays, letters, poetry, and pictures. Issues also include birth announcements, memorials, recipes, a kids page, essays on the history of the area, and information on events. Published by Takilma Common Ground with the support of Left Fork. Takilma Common Ground was created in 1994 to increase communication and stimulate discussion in the community of Takilma, in Southwest Oregon. Volume 1 of the anthology collects the first 25 issues. There is no finer chronicle of life in Takilma, past and present, than the Takilma Common Ground. Published by Takilma Common Ground with the support of Left Fork. Cobra Lily is a review of art and literature, focusing on the cultural and natural environs of Southwest Oregon. We seek to promote voices from this region, as well as voices outside the area which speak to the natural rhythms and experience of life here. rson, Desmond Serratore, Iris Chinook, Pamela Haunschild, Kaci Elder, Susan Gustafson, Veronika Trishyna, Katie Chamberlain, David Newell, Waves Forest, Sydney Clinton, Paul Forristal, and Kelpie Wilson. According to Jennifer Richter, “Judith Arcana’s gorgeous new collection, has movement at its core. Many of these poems are fueled by questions—questions that generate a powerful urgency and contribute to the book’s compelling internal momentum.” The book received the 2015 Turtle Island Quarterly Editor’s Choice Chapbook Award. It’s Oregon’s Illinois Valley as only YOU know it! Discover something deep in the Oregon Caves. Design new playground equipment at Jubilee Park. Create your scarecrow entry for the Acorn Festival. Build the next treehouse at Out ‘N’ About. And how will you top your Taylor Dog? You can do(oodle) all this and much more in this drawing book, designed exclusively for residents of the IV. Here’s the Amazon. But probably better to pick up in Cave Junction, at Bagel Junction, the Visitor Center, or the Southern Oregon Guild of Artists and Artisans (because then you can start doodling immediately). Published in partnership with Radical Roots Press (possibly the premiere in a plethora of partnerings), this collection contains a cornucopia of K. Elder’s complex and often unclassifiable compositions. Available now from, yup, Amazon.com. 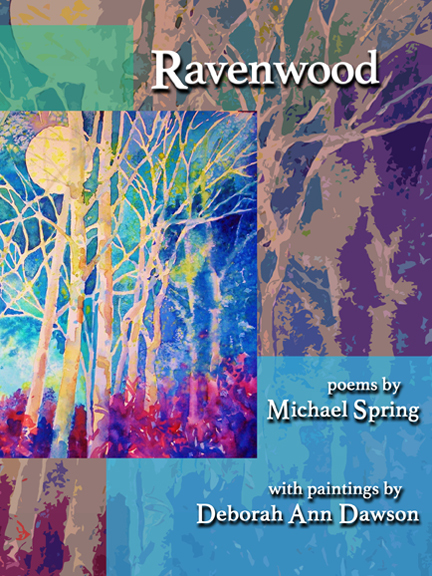 This special book includes selected works from award-winning poet Michael Spring which correspond with the watercolor paintings of Deborah Ann Dawson. They say brevity is the soul of wit. 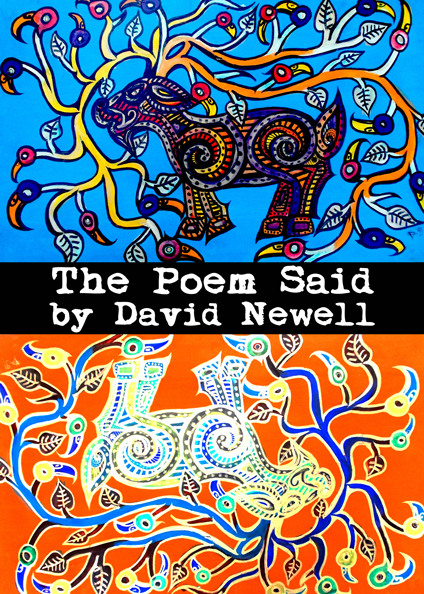 To be sure, David Newell’s first poetry collection includes plenty of each: brevity, soul, and wit. ‘The Poem Said’ presents nuggets of wit and wisdom from the professional wood carver and artist. As a bonus, the collection also features several visual images of the author’s many unique wood carvings. Cobra Lily is a review of art and literature, focusing on the cultural and natural environs of Southwest Oregon. We seek to promote voices from this region, as well as voices outside the area which speak to the natural rhythms and experience of life here. Why Cobra Lily? The carnivorous pitcher plant exists most abundantly in Southwest Oregon. This native plant has distinctively adapted to thrive in our region. We draw inspiration from this plant because we dare to be as unique, publishing the diverse writers and artists of Southwest Oregon’s extraordinary landscape and culture. Issue One features the work of the following artists (in order of appearance): Gary Lark, Pepper Trail, Melissa Matthewson, Patty Wixon, Scott T. Starbuck, ‘Buckwheat Bob’ Harrison, John Noland, Rhonda Lynn, Lilyana Rain, Kindi Fahrnkopf, Kay Elaine Ekwall, Dave Dunbar, Kelly Waldin, Anita Savio, Rich Norman, David Lorenz Winston, Dallion McGregor, Summer Wolf, Juliette Wolf, Isaac Wolf, David Newell, Susan Gustafson, Angela Graves, Annette McGee Rasch, Michael Spring, Savanna G. S., Alan Laurie, Sara Backer, Scott Simpson, Rory Forsythe-Elder, Deborah Ann Dawson, Kathryn Velho, and Kailen Forsythe-Elder. Available at the Southern Oregon Guild and other places around the Illinois Valley and southern Oregon. Also available from Amazon.com. 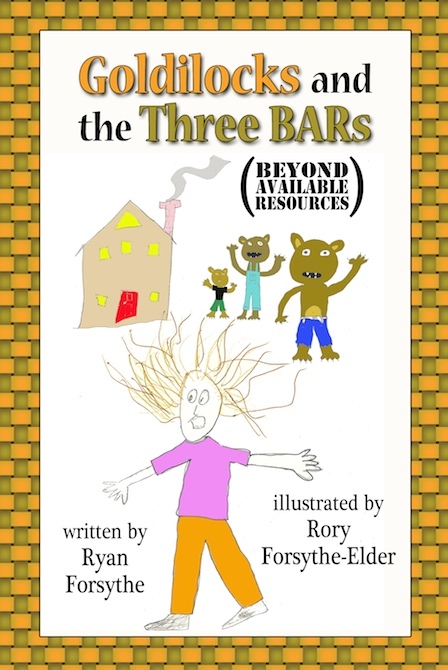 In this updated version of the story of the Three Bears, Goldilocks comes to Josephine County, Oregon. But will anyone help when the Three Bears call their local Sheriff to report Goldilocks’ acts of robbery, vandalism, and trespassing? The book is available from Amazon.com (both print and Kindle versions). When cow Betsy meets her fate at the slaughterhouse, her son lives on—at least until he ends up dinner at a posh country club. The book has the appearance of a children’s book, told in rhyme and complete with illustrations by artist Cassie Hart. 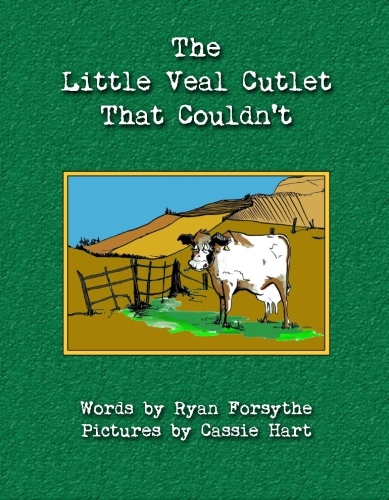 But parents should not be fooled—the book deals with some serious issues, including the treatment of cows in the production of milk and veal. Check out Mike Mannix’s review in Humboldt County’s free alt-weekly, The North Coast Journal. This updated edition is available at Pine Cone Books in Cave Junction, Oregon, and online from Amazon.com.